The paths that Rashaun Stewart and Anthony Brodie took to get to Christopher Columbus High School couldn't have been more different. The respective sojourns, however, that led them to the Bronx-based school has not only earned each a close friend, it has placed both runners in position to win New York State titles while also gaining a place in the national spotlight. Stewart is a Jamaican native who has been in the United States for about a year and a half. He arrived in New York following some time with family in Georgia. Brodie, meanwhile, came to the Bronx from New Jersey and began his high school career at Mount St. Michael, transferring to Christopher Columbus before for his junior year. The duo, now seniors, are the top two 300m runners in New York and are part of an explosive 4X4 team that is also tops in the state. Stewart has the best 300 time in New York this year (33.74) with Brodie just a tick behind him at 33.76. The 4X4 squad, which also includes Ryhan Marshall and Mike Miller, is the top-ranked quartet in New York (3:18.82) and ranked second nationally. Stewart and Brodie go back and forth in just about every event and are usually never more than a split second behind the other. 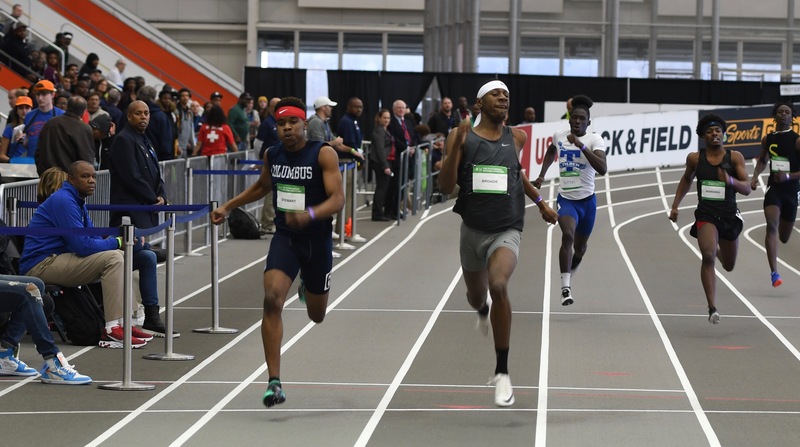 Stewart has a better time in the 300 and 200 (21.65 to Brodie's 21.84) this year while Brodie has the edge in the 400 (48.43 to Stewart's 49.87) and the 600 (1:25.84 to Stewart's 1:26.94). The pair finished one-two in the 300 during the Feb. 23 Toyota USATF Indoor Championships at Ocean Breeze on Staten Island. Stewart (34:05) won but Brodie (34:09) was ever so close. Marshall (35.15) finished third. "Who's faster? That's a good question," Stewart said. "He beat me a couple of times, I beat him one or two times." Stewart and Brodie, however, don't seem to mind finishing behind each other. Their ability to train together and push each other, both in practice and in meets, has made each better. The duo put on another show at the Toyota Championships and will like be atop the heap when the state championships are completed in March. "He's a very good competitor and teammate," Brodie said of Stewart. "He's a challenge. If I don't come right [for a race] he's going to take it away from me. He's a real good challenge for me and keeps me on track." Brodie, who has committed to Villanova, has never had an indoor state title though he did win a state crown last spring in the 400 (47.67). Stewart, who is looking at North Carolina and Binghamton, has never won a title, indoors or out. "I'm getting close to what I wanted to run indoors," Brodie, 18, said. "In the 300, I've pretty much reached my goal. By nationals, I'll be where I want to be. I want to run a 21 low in the 200 and I want to go 46 in the 400. "I'm .02 behind Rashaun in the 300 but that doesn't bother me. It's good to have a teammate challenging me. In the 300, I want the state record [33.17 set in 2015 by Mount Vernon's Rai Benjamin]. We feel like we have a good 4 x 4 team though we have room to improve. I feel like Rashaun and I can split a little faster. My best split indoor is 48.1." 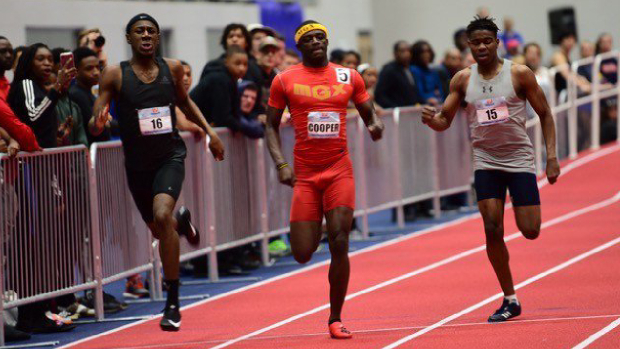 Brodie has 11 first-place finishes during the indoor season with his most impressive one coming in January at The VA Showcase. He took the 300 in 34:09, edging nationally-ranked Tyrese Cooper (34.17) of Miami Norland. "It was pretty exciting," Brodie said of the VA Showcase. "He's one of the best of the best in high school and I wanted to see what I could do against the best of the best. I was surprised." Both runners also have their sights set on running collegiately but the thought of turning pro someday is always a consideration. Each seems eager to make an attempt someday. Stewart has come so far already that making the leap to the professional ranks isn't outrageous. Consider that he is from another country and has excelled on the track while making the adjustment to a different life, a different culture and, oh yes, a different kind of running. "The changes from Jamaica to here have been kind of hard but it's been good," Stewart, 18, said. "I'm doing way better here than I was in Jamaica in terms of track and field. It's been really weird and hard at times because of the turns and banks on the track. It's taken some getting used to. But after I'm finished training I take time out to work on the curves, coming into it and coming off." That he has Brodie to push him certainly helps. Stewart says he looks up to Brodie and that their rivalry is mostly friendly but sometimes it can get heated. Either way, he adds there is always "good energy" after they finish a race. 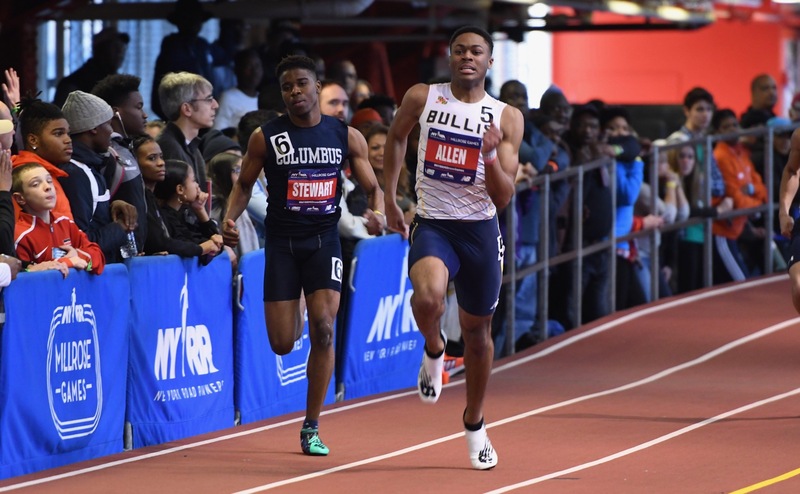 Stewart has been dealing with a minor right hamstring issue but it didn't prevent him from winning the PSAL Championship in the 300 on Feb. 16. He's been undergoing therapy on the leg and says isn't a concern. What is a concern, though, for him and Brodie is finishing up strong this winter and having a big spring. It will complete a journey they began alone but will together, they hope with a flourish.